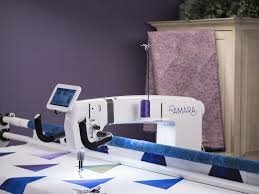 Handi Quilter-Background Work: Fills, Textures and Designs! Please join us for national educator Diane Henry's class. Let's make it work! You'll learn how to make backgrounds fills, designs and textures that can literally transform the look of your quilting right before your eyes. Grid based, free motion and backgrounds built on rulers, this class has it all. Plus, learn the real life top secret way to multiply your background work vocabulary exponentially. You'll never be stuck without an idea of what to do again! Date: May 4, 2019, 1:00pm to 4:00pm. Cost: $49. Please call the shop to register: 540-786-2289.